Our work in Liberia focuses on supporting new approaches to natural resource management. Liberia is a country rich in natural resources—from the rubber that was the backbone of its early economy, to vast forests, and mineral resources. Timber and rubber remain the nation’s main exports, while foreign investments are increasing favouring the mining sector. An estimated 100,000 people are involved in artisanal mining in Liberia, largely extracting gold and diamonds. Their activities, though mostly informal, offer an important contribution to Liberia’s economy. In 2015, artisanal mining was estimated to make up 18% of all official mineral exports. Despite its resource wealth, Liberia still struggles to achieve lasting peace and development, well over a decade since the end of its civil war. The country is especially challenged when it comes to addressing basic infrastructure and services, which were further weakened by the Ebola crisis. Today, more than half the population is under the age of 18 and many adults are unemployed and illiterate. According to the UNDP, over 70% of Liberia’s 4.5 million people are living in poverty, with a lack of education, health services, and basic living standards. Corruption continues to be a significant threat to economic and social development. Liberia is a member of the Kimberley Process (KP) and is required to put in place internal controls that certify the origin of its rough diamonds as conflict-free. Despite being a member of the KP, the country still struggles with the illicit trade of diamonds and other minerals, losing important tax revenue. It is a member of the Regional Approach for the Mano River Union, collaborating with its neighbours Côte d’Ivoire, Guinea, and Sierra Leone to strengthen KP compliance. Liberia’s key natural resources include rubber, timber, iron ore, diamonds, gold, lead, water, palm oil, and wildlife. 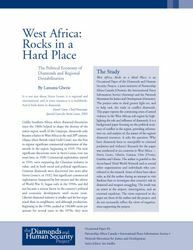 Our research in West Africa investigates the drivers of the illicit trade of conflict-prone natural resources and highlights recommendations for the region’s countries, including Liberia. We examine issues such as formalization of the artisanal mining sector, fiscal reform, harmonization of legislation, and strengthening of internal controls to end smuggling. In 2000, we published The Heart of the Matter: Sierra Leone, Diamonds and Human Security—one of the first reports that drew the link between diamonds and conflict financing in Sierra Leone, implicating Liberia and its armed forces. IMPACT’s researcher and author of the report, Ian Smilie, testified at the trial of Liberia’s former President Charles Taylor about our investigation. Taylor was found guilty of war crimes and crimes against humanity committed during the conflict in Sierra Leone. As part of our work to transform mineral supply chains, we’ve led efforts to support traceability and due diligence, while promoting benefits for Liberia’s miners and their communities. We share best practices on diamond governance and provide capacity building to Liberian stakeholders, including policymakers, private sector, and civil society actors on the implementation of KP internal controls and OECD Due Diligence Guidance for Responsible Supply Chains of Minerals from Conflict-Affected and High-Risk Areas. Through our collaboration with the KP Civil Society Coalition, we provide support to our partner in Liberia to participate in the KP, as well as support and spotlight their capacity for independent monitoring of KP internal controls and due diligence in the natural resource sector. We advance dialogue with our partners in Liberia, including policymakers and the private sector to implement traceability and due diligence as well to ensure benefits reach miners and their communities. Through our partnership with the KP Civil Society Coalition, civil society from Liberia and West Africa bring the voices and concerns of artisanal miners to industry and governments. Together, we engage governments to strengthen their internal controls, and encourage the private sector to put in place due diligence for their mineral supply chains. This report, co-published by PAC and Green Advocates in Monrovia, describes Liberia’s timber, rubber and diamond sectors. 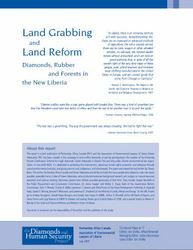 It lays out what must be done by the Liberian government and civil society, as well as the donor agencies, companies and NGOs that work there, to make certain that there is no return to the old pre-war ways of doing things, and to ensure that the country’s natural resources are used for the benefit of all Liberians, now and in the future. 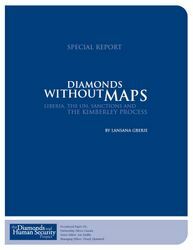 This Report warns that the UN Security Council should not lift its 2001 embargo on Liberian diamonds until the country has an effective diamond control mechanism in place. Diamonds have been at the centre of West Africa’s nightmare for more than a decade.